Television ratings can serve as a useful representation of interest in Major League Baseball, and in the playoffs, more attention is paid to the sport and more attention is paid to television ratings. Over the years, a decline in ratings has been used as an example of declining interest int he game of baseball. For the most part, the “Baseball is dying” motif is more of a silly meme than actual argument. Baseball games again dominated the last six months of programming on local television. On the whole, MLB drew more than 73 million fans, an increase compared to last season. Over a stretch of six months, there was a daily average of more 400,000 fans attending MLB games. The first few rounds of the playoffs were a success on television, as well. The National League had the benefit of two great matchups in the division series, which featured the Los Angeles Dodgers against the New York Mets and the Chicago Cubs versus the rival St. Louis Cardinals. Three out of the four division series games went the full five games. The National League Championship Series set itself up for incredible ratings, with the Mets bringing the New York Market and the Cubs bringing not only the Chicago market but also a 100-year championship drought. The television schedule set up well for the series, putting all of the weekday games in a prime time slot on TBS, relegating the Toronto Blue Jays and Kansas City Royals to the daytime on FS1. The ratings were good for the Cubs and Mets, but the four-game sweep robbed the executives at TBS of the higher ratings a longer and more competitive series would have brought. The Blue Jays-Royals series on FS1 did not produce great ratings, but given certain factors — an afternoon time slot, a fledgling cable cable channel, and a Canadian team — the result was an expected one. Despite the perhaps slightly disappointing factors present in the LCSes, ratings are up overall against last season by close to 20%, with an average of 4.6 million viewers over the first two rounds, which figure doesn’t even account for the millions of viewers in Canada tuning in to watch the Blue Jays. 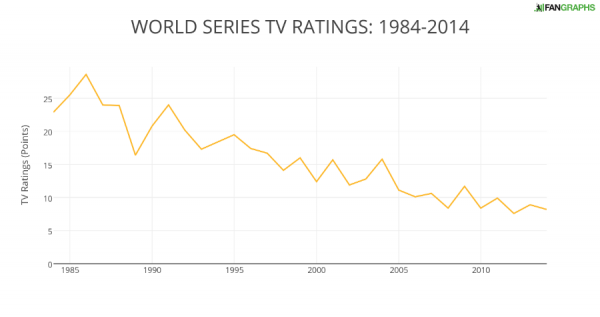 World Series ratings have dropped fairly significantly over the years, but that is in line with television as a whole. 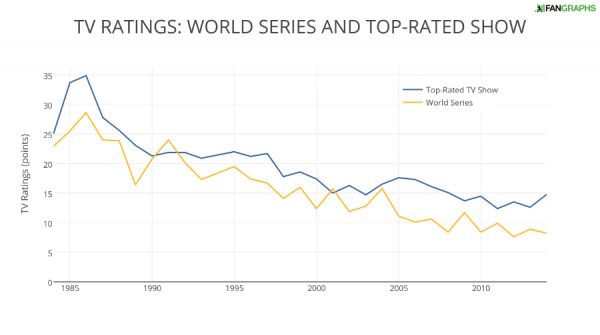 The graph below of World Series ratings over the last 30 years, shown without context, paints an ugly picture of baseball’s popularity, per Baseball Almanac. World Series ratings have dropped over they years, but the fall has been steady and right in line with the rest of broadcast television. The graph above is somewhat jagged for the World Series. Ratings can change fairly significant from year to year. Major markets like New York and Boston can provide a boost to ratings. 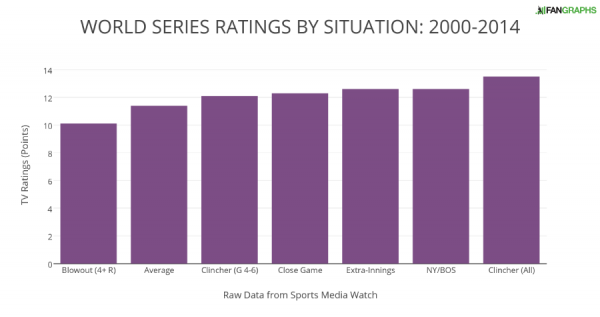 Boston’s historic run in 2004 delivered huge ratings despite a short series, and the Yankees have traditionally received higher ratings than other teams. The team, the length of series, and the competitiveness of the game also play a role. The bigger, more well known a team is, the bigger an audience it delivers. This season, the Mets provide a bit of a boost due to the New York market, but the Cubs would likely have delivered a much bigger audience given the historical significance of a championship after more than a century of failure. The team is not the only factor, however, and the other two relate to how the game is played. When looking at ratings for the World Series, we often only look at the average over the course of the World Series. A seven-game series is not the same as a sweep, as ratings tend to get better over the course of a series. The bigger the stake in the game, the more people tend to tune in. Last season’s series between the Giants and Royals was doing very poorly in the ratings, with few competitive games, but a great Game 7 provided an overall boost. 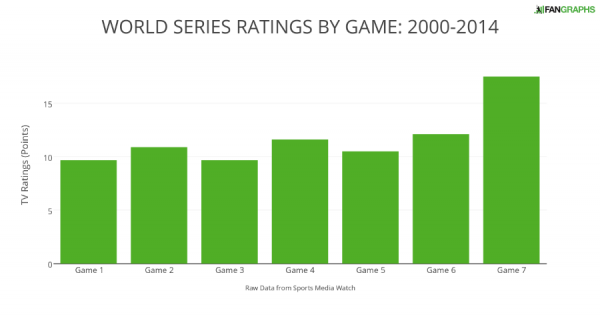 The graph below looks at the ratings for every World Series game since 2000, when Fox gained complete exclusivity over broadcasting the World Series. For Games 1-4, there are fifteen games monitored, but the number of games decreases to four by the time we reach Game 7. When a series goes longer, the ratings get higher, and the average for the series sees an accompanying rise. The games themselves play a big role in how many people watch the game. Fans do not simply tune in for the game and watch all nine innings. If a game gets out of hand early, fans tune out and the ratings fall. The graph below considers a variety of different situations. Close games, clinchers, extra-inning games, and games with New York or Boston all do better than average while blowouts tend to do worse. 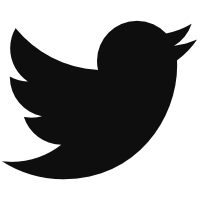 MLB is consumed as a product, and more than anything, people tune in for an exciting, good product. MLB has done very well in the ratings all season, and that has continued in the postseason thus far. The Mets provide baseball with a small advantage heading into the series, but what will decide how many people watch the series will have more to do with the game on the field. If the World Series provides close games and a long series, people will watch. The ratings will not reach what they were 30 years ago, but those ratings have little to do with present-day popularity. Baseball can always do more to reach more people and create new fans, but the sport is currently thriving. We hoped you liked reading New York Market to Affect Series Ratings, But Not Only Factor by Craig Edwards! I also think the time of the games has to be considered. With start times at 8:05 EST, I’m guessing some people (including me, often) are asleep by the time the game ends if our own team isn’t in it. Those of us that have to be up early for work aren’t going to stick around in a 5-2 Game 1 that ends at midnight (or later) unless our favorite team is in it. The pace of games in the playoffs has been way up, and I know many people think it’s “more natural” that way, but it’s a killer for me. I couldn’t find this year or last year, but in 2013, average time of game in the playoffs was 30 minutes more than the regular season. Not only does that make the game longer, it makes it far slower (and more boring). I’m sure many think it’s blasphemy, but I’d love it if they moved the series up an hour every year. Wouldn’t you rather have the West Coast fans miss the first 2 innings than the East Coast fans miss the last 2? Especially this year, without a Mountain or West Coast team in it, I’d have moved it to 6 or 6:30.